Pammy Blogs Beauty: Make Up Bag Remix: Make Up For Ever is Coming to Atlanta for a Makeover Event! 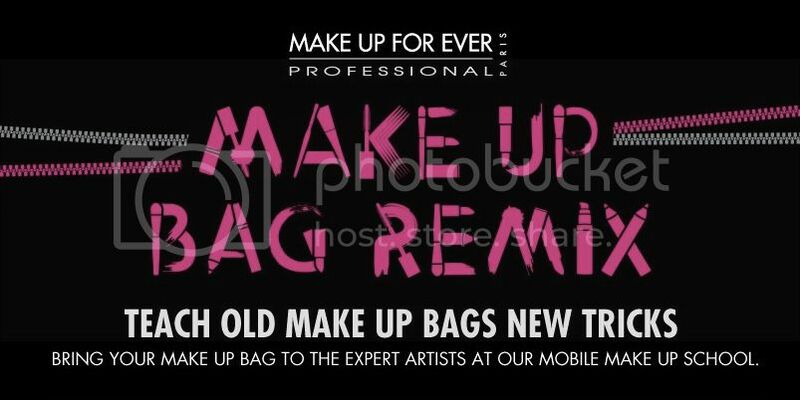 Make Up Bag Remix: Make Up For Ever is Coming to Atlanta for a Makeover Event! Hi there local Atlanta readers! I have a fun beauty event to announce! The pros from Make Up For Ever are coming to Atlanta on November 9th and 10th!!! This MUFE (Make Up For Ever) mobile tour has a unique twist: Makeovers with makeup from your own personal makeup bag! How many of you have items in your makeup stash that you would love to learn how to use properly? (I am totally raising my own hand here!). For example: I know that I sometimes impulse buy those smokey shadow kits only to feel limited in my skill to create a fabulous smokey eye! Well, never fear, MUFE is here to help out. Just sign up using the link below for your one-on-one makeup consultation and bring your own makeup bag. The MUFE artists will show you how to get a beautiful look using your own products. Such a cool idea! MAKE UP FOR EVER’s Make Up School will be hitting the road and heading to Atlanta for our first ever ‘Make Up Bag Remix’ tour on November 9th and 10th. We’re doing something that no make up brand has done before… we know that nearly every woman owns at least one impulse beauty buy that she has no idea how to use, so we’re inviting consumers to bring us their make up bags and we’ll teach them how to use what they already own. They can bring any brand and any kind of product. Our goal is to teach women how to actually do their own make up, not just have it applied by a make up artist which is what usually happens when you sit down to have your make up done. There are two elements to the Mobile Make Up School – 1) Make Up Bag Remix Apt: 30 minute one-on-one make up bag consults and 2) Focus Lessons: Quickie make up lessons for those on the go. Full information is attached in this media alert, along with an image of our Mobile Make Up School. Each client will walk away with a new make up bag, a custom face chart detailing how to use the products they brought, and a list of any additional products recommended by the artist to round out their look. A professional photographer will also be on-site to capture each client’s “after” look, which will be uploaded to an album on the MAKE UP FOR EVER USA Facebook page. I am so excited about this event! I will be there at noon and I hope you local readers will consider coming out too. If you see me at the event, don't feel shy to introduce yourself to me!!! I love to meet my readers and I hope to see you there! I am making an afternoon out of it with my Bestie. It is always great to have some girl-time. Plus, a free makeover. Can't beat that!! !